Did you know that approximately 85% of Americans have their wisdom teeth pulled? Wisdom teeth are the third molars that emerge between the ages of 16 and 20. When your dentist sees that wisdom teeth are going to cause issues for the rest of your smile, they may recommend dental extraction. When so many people need tooth extraction, it makes you wonder why wisdom teeth are needed at all. Why do we have wisdom teeth? The answer may just lie in our ancestry. The most widely accepted theory behind wisdom teeth asks us to look to the diet of our distant ancestors for answers. Early humans ate a much different diet than the soft foods we eat today. Our ancestors lived off a diet that consisted of roots, raw meat, and tough plants. To help them grind these tough foods, they developed a third set of molars and larger jaws to accommodate the extra teeth. Today, humans have smaller jaws and eat much softer foods. However, our genes still produce wisdom teeth that no longer have room to grow. When wisdom teeth don’t have room to properly emerge through the gum line, they can come in at odd angles or even horizontally. In other words, crooked wisdom teeth can cause a lot of damage to your smile and undo years of orthodontics. A dentist will be able to look at your x-rays to determine if you’ll need wisdom teeth removal. Wisdom teeth don’t form until around the age of 10 and don’t emerge until early adulthood. This means that your dentist will have plenty of time to monitor the angles of the wisdom teeth and determine whether there’s enough space in your jaw to accommodate the extra teeth. Wisdom teeth coming in crooked must be removed as soon as possible. If your jawbone is too small to accommodate wisdom teeth, these teeth may become trapped under the surface of the gum or may only partially erupt. In these scenarios, a crooked or impacted wisdom tooth can weaken bone structure, undo years of orthodontic work, and cause pain and infection. Thankfully, your dentist will recommend wisdom teeth surgery before this happens. While most people need wisdom teeth removal during early adulthood, there are some people who are able to keep some or all of their wisdom teeth. If your wisdom teeth are coming in straight and there’s enough space in the jaw, your dentist may tell you that a wisdom tooth extraction isn’t necessary. 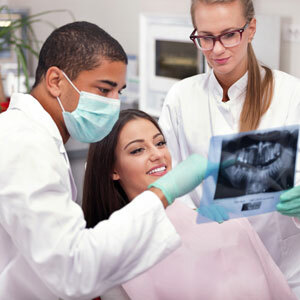 Each patient’s dental history is unique, which is why your dentist will need to look at your x-rays to determine if you are able to keep your wisdom teeth. Your dentist will be able to show you x-rays of your teeth and explain the situation in a way that is easy for you to understand. If you experience wisdom tooth pain, we recommend scheduling an appointment with your dentist as soon as possible. Sometimes the only way to get wisdom tooth pain relief is through extraction. Dr. Yun DDS and his team are dedicated to helping you protect your oral health through wisdom teeth removal and other family dentistry services. To schedule an appointment with our Grand Rapids dentist, call NorthPointe Family Dental at (616) 288-6134.